Curry had 38 points and two filthy crossovers last night and he went and topped himself tonight. In 48 minutes on a quick turnaround, Curry finished with 54 points and shot 11-13 from behind the arc. The Knicks won 109-105, but it felt like they were fighting a losing battle of catch-up with him. Curry's 11th and final three came with 3:42 left in the game and it gave Golden State a 103-102 lead. Immediately after it went in, Tyson Chandler threw his arms up in frustration and one point seemed insurmountable. That's how deflating a performance like that can be, even more so for the Knicks, who have developed a habit of getting torched by guards this season. 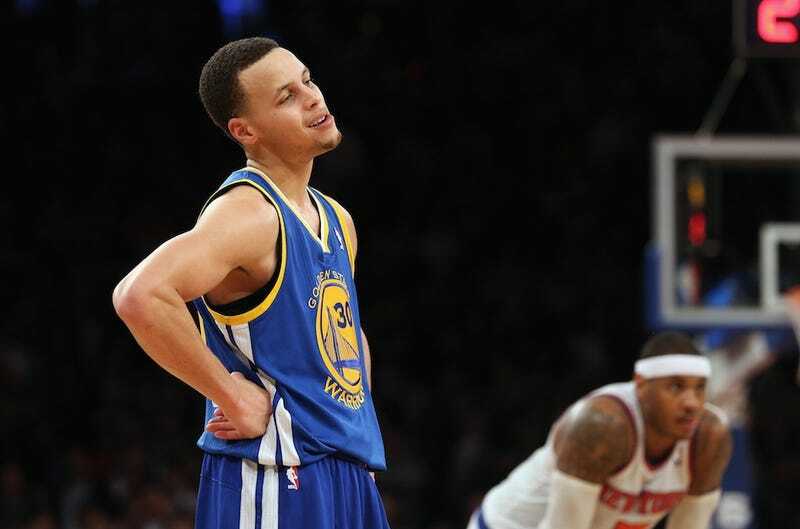 Even though he was in net-barely-moved-when-he-shot territory, the Knicks only needed to stop Curry once. And Raymond Felton stopped him exactly once. With 1:28 left in the fourth quarter, Curry forced a shot and Felton got his hand on the ball and blocked it. That was the game, even though the score was tied at 105-105. Golden State, however, never scored again. Instead, J.R. Smith hit a jumper after the Felton block and Jarrett Jack turned the ball over on the next possession.The Knicks scored again to go up four and Golden State turned it over again. Desperation threes from Klay Thompson were off the mark. Golden State gave the game away with a god-awful sequence of turnovers, poor rebounding and people not named Stephen Curry shooting. With 1:29 left in the game it looked like there was no way in the world Golden State could lose, or that Stephen Curry could finish the game with less than 60 points but the Knicks actually stopped him. For once.